When deciding whether or not to attend graduate school, a lot of prospective students ask how it is different that undergrad. Is it more difficult? Less fun? Stressful? Whether you are thinking of applying to grad school, have a friend/sibling/daughter/son/niece/nephew/etc. 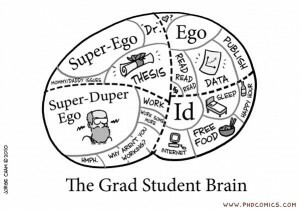 in grad school and still don’t quite understand what it means, or are a graduate student yourself, here you can read about (my opinion on) some of the ways in which these two experiences differ the most. Before I go any further, let me offer some personal background and a corresponding disclaimer. I spent my four years of college at a very small liberal arts school in upstate New York the middle of nowhere, where I majored in psychology. Currently, I’m in my third year of a doctoral Developmental Psychology program at UCLA. Though I’ve tried my best to create this list as a general and widely applicable reflection on the differences between college and grad school, keep in mind these opinions are surely colored by my own personal experiences. With that said, I now present to you, in no particular order, the top 5 ways that grad school is different from college. 3. Social life. In college, you constantly meet new people. Even at a school of 2,000, I was still getting new introductions during my senior year. Especially if you lived on campus, you were frequently spending time with your peers. Meals, classes, social events—it was a very socially stimulating environment. In graduate school, you enter with a cohort of other students, oftentimes bonding through shared course experiences or involvement in the same labs. But, there aren’t the same sorts of ‘team-building’ experiences that are so common in undergrad, such as pre-orientation trips or RA-organized dorm activities. As you get further along in your program and finish taking classes, you also see less of people outside of your own lab. Meeting people outside of your program/school altogether takes even more effort. Therefore, it’s important to take initiative to create and maintain these relationships both in and outside of the academic environment. Given that graduate school is academically rigorous and thus can trigger a lot of stress, making sure to seek out and capitalize on your social support is critical. This also includes making efforts to maintain past social relationships, even if grad school puts you in a different time zone. 4. “Free” time. In college when you finished your homework, a paper, or a project, you could breath a sigh of relief until the next assignment was due. Even with the most rigorous course load, there usually came a time (e.g., winter break), where you literally had nothing else you could do for school. In grad school, ‘free time’ feels more like a decision than a fact. There is always something you could be working on—writing, reading, analyzing—there is rarely a defined ending to these things. Consequently, as a graduate student you have to develop top-notch time management and self-disciplinary skills. Because there is always something more to do, the critical task becomes knowing when it’s okay to take a break and create ‘free time’ for yourself, whether it be to exercise, spend time with friends, or binge watch reality television (I warned you about personal bias). 5. Independence and agency. Thus far I’ve probably made grad school sound like a much less fun version of college. But do not get me wrong; there are some great parts about being a graduate student—opportunities and privileges that do not come your way during the undergraduate years. As a grad student, you are granted a new level of independence. Yes, there are still course requirements and academic landmarks to complete, but you receive (and are in great need of) extensive individualized mentoring from experts in your field, and you have much more control over both the content and method of your study. Especially later in your graduate career, once you’ve finished course requirements, much of your time is spent developing research questions, designing studies, and writing papers. You have opportunities to ask the questions that interest you, collaborate with others who share similar passions, work closely with extremely talented and intelligent faculty members. Graduate school is significantly more academically intense than undergraduate, there is no doubt about that. But, you pursue this path to complete an in-depth study of an area that interests you; rather than solely consuming information through classes, you are also constantly creating knowledge through your own work. Special thank you to Jide Bamishigbin, Maggie Bauer, and Andrew Moskowitz for their contributions and feedback on the article (and for being integral parts of my graduate school social life).